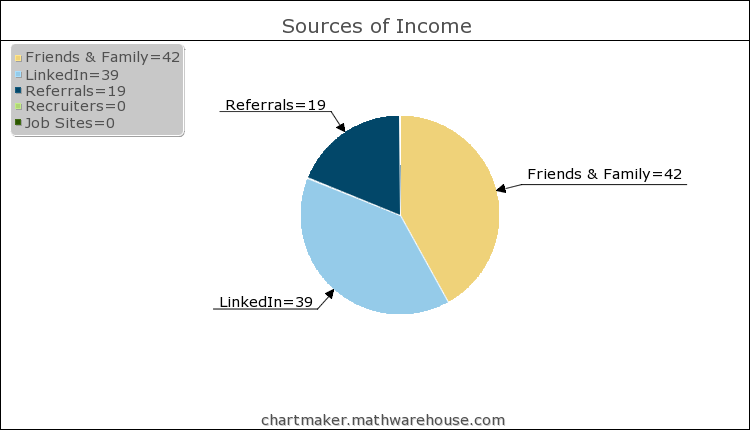 So, about 60% of my income is from my personal network: “Friends & Family” (my direct network, people I already knew reaching out for software help) plus Referrals (my indirect network, friends of friends & family). I was surprised to see LinkedIn at almost 40%, but the numbers don’t lie. This is from two individuals (not recruiters) reaching out on LinkedIn for help, that turned into successful gigs. What was surprising is what didn’t make it on the chart: recruiters and job sites. I’ve spent plenty of time talking with recruiters, as well as contacts from sites like http://djangogigs.com/, but not a single one turned in to an opportunity. Using Timothy Ferriss’s beloved Pareto Principal, I’d say that about 80% of my time trying to keep my pipeline full is spent talking with recruiters, searching job sites, and applying/following up with the contacts there. Yet, this time doesn’t even result in 20% of my income, it results in 0%. Zero percent. In other words, 100% of my freelance income comes from sources reaching out to me, which is both wonderful and chaotic. The wonderful part is that I can use this data to invalidate spending time on looking for new opportunities. The chaotic part is that I have no control over my pipeline, so I have to have faith that jobs will keep appearing. For 15 months, they have, but if anything changes, I’ll be sure to let you know! For anyone else freelancing, I’d definitely recommend this exercise. Personally, I learned that I should generally ignore recruiters and job boards, while making sure to keep my personal network impressed with my work and maintaining a nice LinkedIn profile. This entry was posted in Uncategorized on March 26, 2013 by Mike Rooney. The recent launch of Vine made me wonder why a big company with plenty of resources wouldn’t launch with Android support. While I think there are tons of merits to being lean and getting one platform out there, not launching with cross-platform support has some nasty side-effects, especially when the other platform is the largest market percentage. Android users have already accepted that they can’t use your app. Getting users to install your app at peak hype is great. If you release an Android version even a month later, I’m likely way less interested in playing around with it, because I’ve already seen other people use it, have an understanding of it, and it lacks freshness and excitement. I can’t be an early adopter? I don’t want to join late to the game. Android users may never know you now support Android. One of your biggest moments of PR is likely product launch. One of your smallest is probably the same exact features on another platform. Unless your Android support is somehow a huge story that gets written up on every tech blog like your launch, I’ll probably never see it and will never know I can begin using it, even if I am really excited about it. Both of these happened to me with Instagram. When I first heard about it, it sounded cool, so I looked for it on the Android market and realizing it wasn’t there, made a sad face and went on with my life. I didn’t find about their Android support until much later (unless you set up a Google Alert for “instagram android”, I’m not sure how you would), and by then the hype was gone and being such a late adopter wasn’t nearly as interesting. On a higher level, this probably creates a negative feedback loop for non-iOS platform shares. These factors mean you engage a lower percent of Android users, biasing its share. This leads to others looking at that data and using it to validate an even more delayed Android launch, and so on. Of course, this applies primarily to the mobile phone space. Some apps have released only for iPad, and as the Android tablet space doesn’t seem as mature and doesn’t have nearly the market, that decision seems reasonable. What do you think? This entry was posted in Uncategorized on March 14, 2013 by Mike Rooney. Part of my disenchantment with startups has come from the ways that startup employees are discouraged from making responsible investment choices, while the VCs that fund them are allowed and encouraged to use sound investment principals in their own companies. There are two interrelated principals that I found at odds in the startup world, which ultimately caused me to leave it. In the investment world, investing your money in only one stock is a huge no-no. Diversify, diversify, diversify. If the company fails for reasons you weren’t able to foresee, you’re out of luck if that was your only investment. VCs understand responsible investing and invest in many startups at once to diversify and both increase their chances of picking a winner and decrease their exposure to a particular failure. Yet, as an employee, investing your time in a handful of startups at once is frowned upon; you are expected to work full-time at a single company at irresponsible investment risk. VCs use the knowledge that most startups fail and diversify. As an employee I’ve twice seen attempts (at one company, led by me) to use this knowledge to at least encourage personal investment and get the company to offer a decent retirement savings (IRA / 401K); both times it failed. Oh, and don’t pull out early just because the forecast isn’t good like a smart investor would, or you might be labelled a job hopper. When I asked if I could do work on the side for another company, it was rejected. I then asked if I could work part-time so that I could diversify my time between work and personal growth in other ways. The response was that that would be tantamount to quitting, so I had to choose. And yet VCs only spend a fraction of their time each week or month on one particular startup, so that they each get attention, because that’s healthy. Why is it considered unhealthy for an employee to do the same? Isn’t in unhealthy to spend the majority of one’s waking hours during the week on one particular thing? How often have you seen a bug tracker response / project status analogous to “Sorry, I don’t have time to work on this anymore, I have a real job now.”? Some might argue that VCs are paying, while employees are getting paid, so VCs are both at more risk and deserve more control. What I’m trying to point out though, is that we’re both investing; VCs invest with money, employees invest with time. However, lost money can be re-gained, while lost time cannot. Which is the riskier and more meaningful investment? (Update) Finally, I want to mention that the general problem seems to be the startup work culture (and perhaps Western work culture in general), not the individual people involved. Everyone I’ve worked with and met, including managers, CEOs, and VCs, are all good-hearted people, and I’m quite grateful for the experiences I’ve had with them. This just serves to make the double standard a little more fascinating. This entry was posted in Uncategorized on February 1, 2013 by Mike Rooney. While I was previously paying myself a flat monthly amount based on my budget, evaluating my personal finances was still confusing with the business income being tracked alongside my personal assets. I didn’t want months without business income to look like I had lost money, as long as I was able to pay myself from business savings and stay within my budget. As such, I’ve stopped including the business checking and savings account balances in my personal assets on Mint.com and wxBanker. Now all I see coming in each month is my payment to myself without large swings from inconsistent business income, and it is very straightforward to evaluate the sustainability of my personal finances. I’ve also incorporated as an S Corporation (Michael Rooney Inc), as this allows significant income tax savings via disbursements, plus some great benefits including a medical reimbursement plan and a Simple IRA. Acting as a corporation also can make life easier for your clients, as corporation to corporation work doesn’t require them to file a 1099, and also makes it less likely that you could be reclassified as their employee by the IRS. Talk to your accountant to see if an S Corporation is right for you! Finally, I’ve been heavily using Freshbooks.com to track time and set up automatic recurring invoices; I just input the hours each day, and Freshbooks handles sending the client a monthly invoice. While my previous goal was to maintain my salaried income working ~20 hours per week and taking lots of vacation, I’ve found that this wasn’t a good fit for me for various reasons. First, my previous salary was an arbitrary amount, and I can thrive quite well on less while still maxing out a Roth IRA and having savings leftover. Second, I don’t feel a frequent need for vacation or “escape” as my current schedule feels very relaxed, especially as I can be pickier and choose the most enjoyable work when I need to find less of it. Right now, I’m able to comfortably support my budget with ~10-12 hours of work per week; anything extra is “work for work’s sake”. A specific goal for this year is to develop a recurring stream of monthly income from clients and incubation projects. On the client side, this comes primarily from monthly hosting and support plans. These are currently accounting for about 15% of my monthly budget, and I’d ideally get this to 25% in this quarter. I’ve also been spending some time on incubation projects with the goal of contributing beneficial software to the world, which can be optionally supported by small recurring donations of $3-$5 per month. I think it is really cool how a personal project with only 1,000 paying users at $5/mo would generate a very significant $60K/year. I’d love to hear from others who have iterated on their self-employed life and made improvements, or from anyone with any suggestions or comments! This entry was posted in Uncategorized on January 28, 2013 by Mike Rooney. OR: Stop Defending GMOs Because You Love Science. Recently I’ve noticed a lot of people frowning upon GM dissent, generally claiming that the science is sound and the food is not dangerous. However, the issues are significantly more complex, and saying GMOs are okay because they are perfectly safe to eat could be logically compared to saying that food made by slaves from stolen goods is okay simply because it is safe to eat; unfortunately, one merit does not cancel out other problems, regardless of how much we may love science. A lack of genetic diversity is fragile and dangerous. All species need genetic diversity to survive, so when a disease or pest comes along, ideally some are naturally resistant and can repopulate. This isn’t just a theoretical “nice to have” for our crops. Lack of diversity is why the fruit we all know as a banana today is the inferior Cavendish variety, instead of what our grandparents knew as a tastier and less bruise-prone banana, the once-predominant “Gros Michel.” We lost that superior banana strain to Panama Disease, because all the plants were genetically identical and thus all prone to the disease. (Not surprisingly, a new strain of Panama Disease is now threatening the also genetically identical Cavendish.) On the other hand, genetic diversity is why we still have wine despite Phylloxera; not all vines were susceptible to the pest, and by their genetic grace, to this day vines are generally grafted onto rootstock of resistant varieties that allow them to survive. What’s going to happen when the next disease or pest hits a global GM staple? I chose this point first as I think it is a great example of why we need to consider not just the direct but also the indirect and long-term consequences of GMOs. The modified traits are anti-consumer. The modifications that I’ve read about are generally for improved yield or stronger crops, which might be helpful to a farmer, but isn’t a reason for me to be excited about it in a supermarket. This is especially true as these traits often come at the cost of pro-consumer traits: “Efforts to breed new varieties of crops that provide greater yield, pest resistance and climate adaptability have allowed crops to grow bigger and more rapidly,” reported Davis, “but their ability to manufacture or uptake nutrients has not kept pace with their rapid growth.” As that article points out, the vitamin and mineral levels in industrially produced food have been dropping significantly due to the selection pressures of industrial agriculture. Another troubling example is engineering herbicide / pesticide tolerance into plants so that farmers can heavily spray their plants. This causes pesticide poisoning and birth defects in workers and their children, and contributes to coastal dead zones. The beneficial traits don’t even beat small-scale, organic farming. While it may seem that increased yields and stronger crops is great for feeding the starving people of the world, we should consider a few things. First, is this even true? Well, “data compiled by the Rodale Institute’s Farming Systems Trial (FST) shows that…in every single category, organic farming systems proved to be far more viable and sustainable than any conventional or GM system. Initiated back in 1981, Rodale’s FST is the longest running, side-by-side comparison of organic and chemical agriculture that has ever been conducted in the US.” In other words, just because GM crops can improve the yield of industrial crops, doesn’t mean there isn’t a more efficient way. Second, are farms sending any supposed increased yields to starving children in poor countries? Or are they using these advantages at industrial scale to lower prices and push family farms out of business? All that, and I didn’t even have to touch on the evils of Monsanto, which simply can’t be ignored when they potentially control 98% of the US soybean market and 79% of the US corn market. This entry was posted in Uncategorized on January 21, 2013 by Mike Rooney. 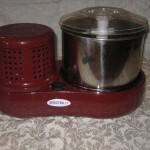 I somewhat recently acquired a melanger, which is a stone grinder used for chocolate making. 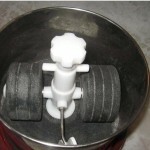 It has a motor which turns a belt, which turns a stone base and two stone rollers. It takes things like cocoa beans (in the form of nibs) and ground nuts, and liquifies them into cocoa liquor and nut butters, respectively. I couldn’t find that many resources online about how to make either of these things with it, so I experimented and came up with some things that work. Before I start, for anyone reading this who is sad that they don’t have a melanger, you can make very delicious nut butters in a food processor by just processing the nuts for 5-10 minutes. 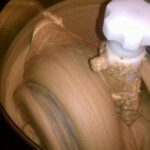 My small $25 4-cup Cuisinart has made countless cups of almond butter. The results will be different, however, as I’ll cover at the end. Okay, back to the melanger. Here’s a recipe that will yield about 4 pounds of almond butter. 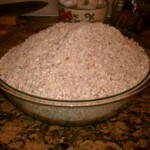 Feel free to substitute almost any kind of nut; cashew, walnut, hazelnut, peanut, and many more will work. 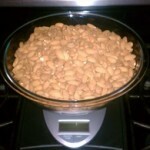 First, you’ll want to measure 4 pounds of almonds. I’ve found that if you use much more than 4 pounds, the process gets rather slow and you’re better off doing a second batch after removing the first one.For the almonds, feel free to use raw, pasteurized, roasted, salted, unsalted; whatever makes your almond dreams come true. I use unpasteurized almonds, which are only legally obtainable directly from the farmer in the US, because it makes me happy to do so. Generally I prefer unsalted things as well because then I can choose the salt myself (in this batch, applewood smoked sea salt). Next, pulse them in a food processor (likely in ~30 second batches) until you end up with something mealy / flour-like in texture. 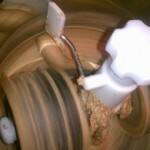 Put this into the melanger slowly, 2 cups at a time. Adding it any faster will likely cause the melanger to seize and you’ll have to take some out. When it becomes smooth and butter-like, it is time to add another 2 cups. Add anything else you’d like. If you started with unsalted nuts, I’d recommend 1T or so salt (to taste, try smoked). You can also add fun things like flax and/or chia. 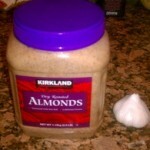 For 4lbs of almonds, I’d use about 4oz of each added ingredient that you want. It’s done when you want it to be done. I like it creamy, and if you do too, wait for a little gloss (1 to 2 hours). Unscrew the top, lift up the bowl, and pour it into your favorite container. Refrigerate and enjoy for a long time. So there you have it! For what it’s worth, my personal experiment resulted in a 90% yield, such that starting with 4 pounds of almonds resulted in 3.6 pounds ending up in the final container. However, this didn’t include all the almond butter I scraped off with my finger for tasting and before cleaning, which my stomach tells me was no small amount. This entry was posted in Uncategorized on January 14, 2013 by Mike Rooney. Eliminate lodging costs whenever possible. I’ve had fairly good luck with this last year, by staying with friends when visiting places where I know someone (a great way to catch up as well), or piggy-backing on others’ vacations where accommodations are already paid for. I’m very fortunate in this regard as my parents travel frequently and typically rent a suite to have a kitchen, and these almost always have a second bedroom or at least a pull-out couch. If you aren’t in this situation, something like couchsurfing.org or caretaker.org can provide free accommodation. Maximize credit card / reward points. There have been multiple credit card offers recently that, as a sign-up bonus, each give around $500 towards airfare, on any airline and flight you choose with no blackout dates. They don’t typically have any annual fees the first year and don’t require paying a cent of interest. They get you with the annual renewal fees, so just set a calendar reminder to cancel. While it may sound too good to be true, I’ve done a bunch of these over the past few years, and the game really works, without even hurting your credit. After signing up for two of these recently, I’ve now got about $1,000 banked, which will cover 2-4 round-trip flights. Airline credit cards can also be a great deal; I just booked a free round-trip flight to Key West using 25K Delta miles received as a sign-up bonus on their Skymiles card. As an extra bonus, you also get free checked bags, priority boarding, upgrades, and more. Finally, many of these points can be redeemed for cheaper modes of transit like Amtrak. For the 40,000 points from a Chase Sapphire, you could make 5 round-trips within the Northeast region, instead of 1-2 round-trip flights. Or you could cash it all in for a coast-to-coast sleeping train and see many parts of the country, as they allow you to get off, stay for a few hours (or days), and get back on the next train. Tack on vacation to business travel. If you ever go to conferences, meetings, or otherwise, that are paid by your company or client, book your flight to return a week or two later than usual. If it is the same price, I’ve never had anyone mind; often it can actually be cheaper as you can come back on a non-peak day of your choosing. Use credit card points or any technique in #1 to avoid lodging costs. If you have any cheap travel techniques, please do share them! This entry was posted in Uncategorized on January 7, 2013 by Mike Rooney. I’ve recently gone from receiving too many (unimportant) emails and checking email frequently, to receiving only about 5-15 emails per day and checking it just once each day at noon. All of this was due to great tips received from others, so I wanted to share what I’ve collected from various sources. I’m going to assume you already use Gmail or otherwise have a good spam filter, but if not, that’s step 0 minus! For the past year or two, I’ve also already been aggressively unsubscribing from emails I didn’t really need to receive (an information diet), and practicing a fairly literal Inbox Zero, both to great effect. Those are both great steps if these aren’t for you. Turn of all email notification sounds, lights, and indicators on your phone, computer, and any other device. As obvious as this seems to me now, it took this tweet from David Siegel for me to even question their value. They are great attention and context stealers, and while addictive, are a drain on productivity and concentration. Instead, you could check your email in between periods of work, even if that has to be every 15 minutes when at work. In the “push notification” world we live in, this can sound like blasphemy to programmers taught to avoid polling; however, we aren’t computers that can store our previous context losslessly while we process something else, nor can we process that email in just a few milliseconds and move on. Be a queue, not a stack. I used to check my email first thing in the morning, but then I’d get distracted and be late to shower or not have enough time to grab breakfast before work. Similarly, I’d check email before going to bed and get distracted, staying up too late. Another bad time for me personally was on subways, as I couldn’t click unsubscribe / RSVP links without internet access, and if something needed a longer reply or attachment, it would take much longer on the phone if it was even possible. Then I’d just have to go home and re-process half of the emails, while thinking the whole way that I couldn’t believe that person needs me to re-send an attachment because they don’t know how to search their email. Now I read on the subway, or just relax. A great tip from The Four Hour Workweek, and one the author recommends to take if you only take a single tip from the entire book, is to not check email for the day until you accomplish your most important task[s] for the day. Giving it a shot, I decided not to check email until 11AM, after I’d showered, made breakfast, and meditated. I had a much easier time following these morning habits! Unroll.me is a great service that provides a single digest for all your non-urgent email. Emails from mailing lists, LinkedIn, Twitter, Facebook, your bank, and basically all automated emails don’t need to steal your attention at random periods throughout the day, so Unroll.me takes all of these out of your Inbox and sends you one daily digest, allowing you to click through to the important ones as needed. This about halved my daily email count, and I was really surprised at how many things actually made sense to receive grouped together at one time, after I gave it a try. You can always add and remove things to the digest, based on your preferences. Once you are used to receiving a set of emails at a specific time each day, enjoying less frequent distractions, give it a shot for all emails with Inbox Pause. This is a browser extension that adds a “Pause” button to your Gmail inbox, temporarily redirecting all mail to a Label until you Unpause, optionally creating an auto-responder. The benefit of this approach is that your phone and any other device will also stop receiving email, not just your current browser session. I started using this to only check email twice a day, or to make it easy not to check email until a specific time of day. For example, this made it a lot easier for me to not check email until 11AM, or late at night, as sometimes I’d need to pop into Gmail to search for a message, send a quick email, or use Gchat or Tasks, and I didn’t get distracted by the new emails in my inbox. After trying Inbox Pause for a bit, I made my default state “Paused”, and every day at noon I’d click “Unpause”, the emails from the last 24 hours would pop in, then I’d click “Pause” again for 24 hours. Inbox Pause is a great stepping stone to batching, but as it requires manual work for each email batch, it isn’t ideal for enforcing batched email. After realizing how simple the Inbox Pause approach was (creating a filter that sends all email to a label, and move them back when desired), I wrote a simple service using Gmail’s OAuth + IMAP that holds emails in a label, moving them to the Inbox once daily at noon. It also handles Unroll.me emails as expected. This has made such a huge difference for me. I’m no longer wondering what’s in my Inbox or if I should check it, because I already know the answer: nothing. No more distractions throughout the day to keep me from the next task at hand. I just check it once daily at 12pm, ideally clearing it out completely in 5-15 minutes, and being done with email for the next 24 hours. This entry was posted in Uncategorized on December 31, 2012 by Mike Rooney. Earlier this year, I started using http://www.joesgoals.com/ to keep track of my goals. The idea was that if I 1) defined the habits I wanted to have, and 2) looked at it daily, then I’d be encouraged and more likely to do them. Based on a year of use, it definitely worked! I kept it as a pinned tab in Chrome and looked at it daily. If a checkmark was missing, it was a reminder to act. If a lot of checkmarks were missing, it was a reminder to change my schedule or behavior. However, as I used Joe’s Goals more, I found it had a few problems: visual clutter, frequent downtime, functional complexity, and lack of perspective for infrequent (weekly / monthly) goals. To address this, I created a very similar application, simplifying the UI, removing features I didn’t use (negative goals), and adding the ability to have weekly, monthly, and yearly goals in addition to daily goals. This last point was a big one for me; I wanted to be able to say that I want to do yoga weekly, and be able to see each box as a week so I can see trailing weeks to review performance. It’s been living happily and stably for some time now at http://goals.rowk.com/, and you are more than welcome to sign up and give it a whirl as well. Don’t worry, it has great uptime and I keep daily backups! I’d love any feedback, or better yet forks! Or, if you are happily using something else, please do share. This entry was posted in Uncategorized on December 20, 2012 by Mike Rooney.